Now in its 20th year! The Petit Undergraduate Research Scholars program is a competitive scholarship program that serves to develop the next generation of leading bioengineering and bioscience researchers by providing a comprehensive research experience for a full year. Open to all Atlanta area university students, the program allows undergraduates to conduct independent research in the state-of-the-art laboratories of the Parker H. Petit Institute for Bioengineering and Bioscience and other bio-focused Georgia Tech labs. Scholars develop their own research project within the term of January to December each year. NOTE: For the 2019 class of Petit Scholars, we anticipate placing a certain percentage of scholars into projects funded by donors who direct their support to be used for a specific type of research. In addition to a wide variety of bio-related projects, there will be a particular focus on scholars interested in working on independent research projects in the areas of bioinformatics, immunoengineering, neuroengineering and pediatrics (including gaming, robotics, data analytics, interoperability, process improvement, nanomedicine, sensor and device development). For pediatric related projects, a signed IP agreement will be required of all scholars. Petit Institute faculty labs, graduate student mentors, and undergraduates participate in the areas of cancer biology, biomaterials, drug design, development and delivery, molecular evolution, molecular cellular and tissue biomechanics, regenerative medicine, stem cell engineering, and systems biology. Since its inception in 2000, the program has supported hundreds of top undergraduate researchers who have gone on to distinguished careers in research, medicine, and industry. 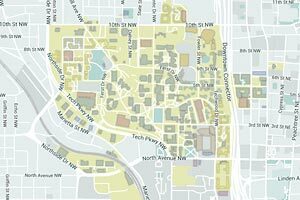 Originally it was established as a summer research experience for undergraduates at Georgia Tech by the Georgia Tech/Emory Center for the Engineering of Living Tissues (GTEC), a National Science Foundation-funded Engineering Research Center. The program now provides a full year research opportunity, and it has grown from funding 7-10 scholars per year to 23 scholars in 2018. To date, the program has funded over 263 scholars from Georgia Tech, Morehouse College, Spelman College, Georgia State University, Emory University, Agnes Scott College, and Georgia Gwinnett College. Petit Scholars receive training that provide a solid foundation for them to pursue advanced degrees in science or engineering. This graph depicts the career status of Petit Scholars following the completion of their baccalaureate degree. 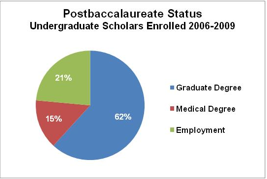 As shown, 62% entered a graduate degree program and 15% entered medical school indicating that close to 80% of Petit Scholars go on to obtain advanced degrees. For more information about applicant criteria, selection timeline, and to submit an online application for the next scholar class, please click here. Funding for the Petit Scholars is supported by Atlanta area community members, including friends of the Petit Institute, as well as corporate sponsorship. If you are interested in donating to this valuable program, please contact us.